Sustainability Club members Emma Mader and Elly Buch, seated at center, help to hand out information and resources about recycling and composting in the Student Union. 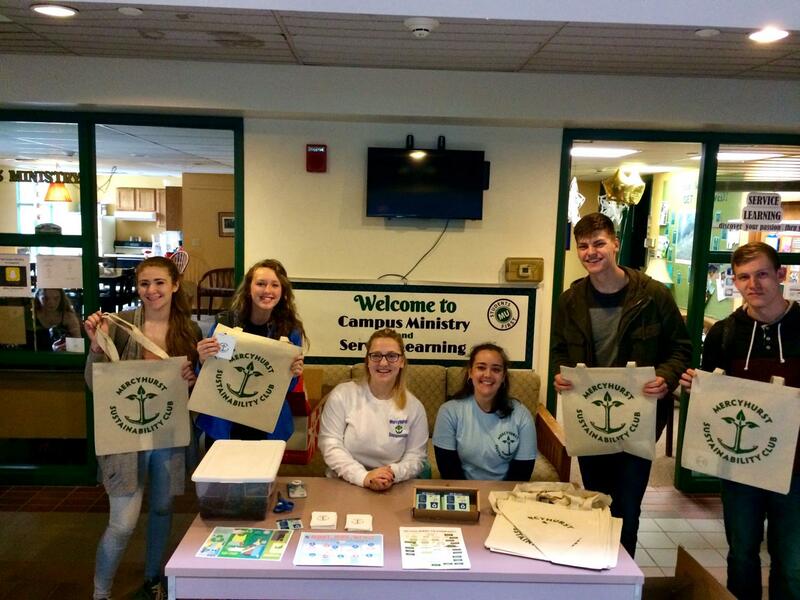 Freshmen Carly Holtzman, Julia Wrest, Nathan Brand and David Steets received free reusable tote bags for their involvement. 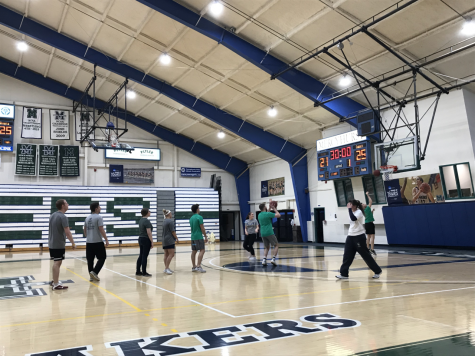 Earth Week 2018 is underway at Mercyhurst University, with activities running from April 23 to April 28. 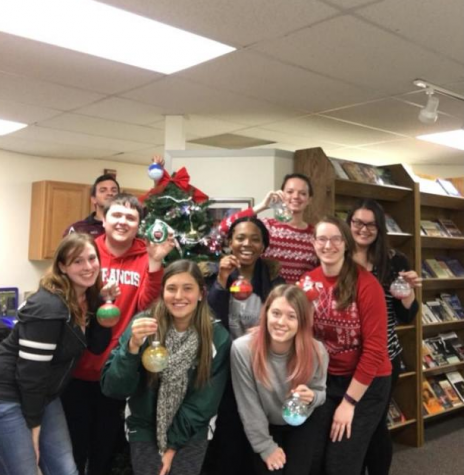 The array of campuswide events stem from a collaboration of different departments and clubs, namely the Sustainability Department and its work under Sarah Bennett, Sustainability Coordinator. The week opened with meatless options in the Grotto Commons and vegan snacks in the Zurn lobby on Monday morning. Monday evening saw a talk from Lois Gibbs, environmental activist, co-sponsored by the Evelyn Lincoln Institute for Ethics and Society (ELIES) and Sustainability Office, as part of the Charlene M. Tanner speaker series. Gibbs, who founded the Love Canal Homeowners’ Association in 1978, spoke about her work to lead residents of Love Canal in their struggle to relocate from a toxic waste dump site in their neighborhood 40 years ago. 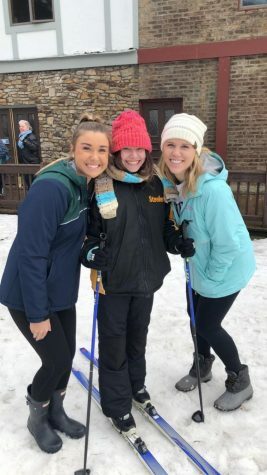 Gibbs discussed how, after moving into a house in Niagara Falls, New York, with two young children, her kids slowly developed severe health issues including immune diseases, liver issues and eventually, leukemia. Having no family history of these conditions, Gibbs sensed that something more was wrong. Of the 800 families in the area, 56 percent of children were born with health defects, and a startlingly high percentage of pregnancies ended in miscarriage or stillborn births. Gibbs discussed how toxic poisons from chemical factories and the canal were seeping into homes and groundwater, essentially poisoning residents with chemical waste. Her mobilizing work eventually led to the relocation of 800 families and the cleanup of the site after years of struggle. Gibbs also had the opportunity to speak with some classes and further spread her message. 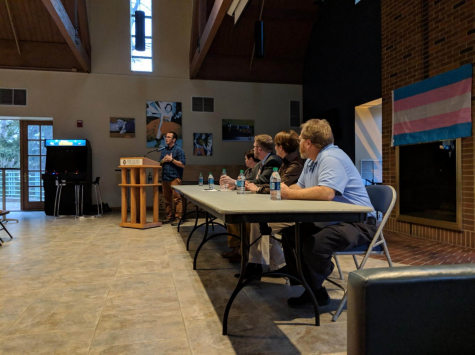 Following this event, a workshop on recycling and composting was held in the Student Union on Tuesday afternoon. The film “Before the Flood” was also screened in Zurn 114. Presented by National Geographic, it features Leonardo DiCaprio traveling to five continents and the Arctic to witness climate change firsthand. Wednesday’s events will include a “Trashion Show” organized by the Art Education Club, Fashion Council and the Sustainability Club. Students can model outfits they designed and created from reused materials. Bennett has been integral in the organization of this week. She hopes the positive effects of sustainable living can be felt by students long after April 28. 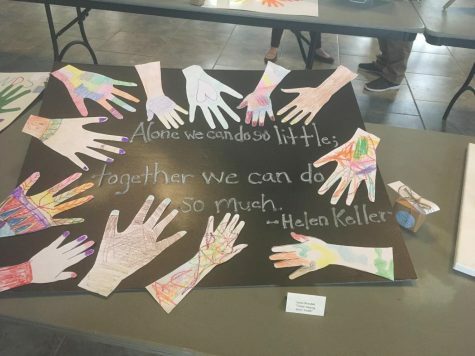 Events are also underway at Mercyhurst North East, where students in the Criminology and Criminal Justice Club organized campus and community cleanup on April 20, which will included guests from the Barber National Institute. 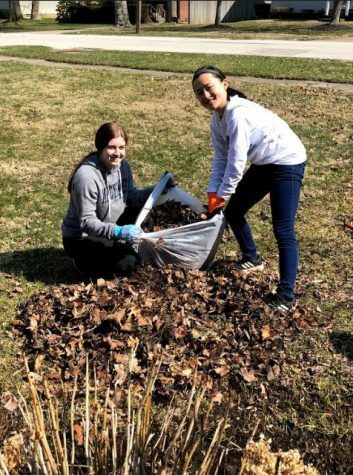 Earth Week will draw to a close with the Great Campus Cleanup on the Erie campus on April 28, where student volunteers can dedicate their time to beautifying our grounds following SpringFest celebrations.